We got up early on Wednesday and were greeted by a dreary, drizzly day. It didn’t take long to grab showers and pack up the rest of our stuff. Karl and Julie’s kids came down to say bye and Chris and Becky came over with these apple pastry things! We said our goodbyes and prayed together before piling in the van for the 2 1/2 hour drive to Belgrade. I enjoyed the scenery while Matt and Karl talked about computers and other assorted guy stuff. I was getting a little nervous about the time since we got to the airport at 11 and our plane was due to leave at noon. There was a line to check-in, but we finally got our turn and our 2 bags were close enough to the weight limit that we were okay and didn’t have to pay any extra. We said goodbye to Karl and were very thankful that there was no line at security or passport control. We just put our bags on the belt, left our shoes on, and walked right through the metal detector. They stamped our passports and we headed for the gate. We walked through another security checkpoint (just like the first) to get to our boarding area and were there in plenty of time. The plane was an older 737, but it was comfortable and we got good service during our almost 2 hour flight. We got a sandwich, peanuts, and a candy bar for lunch! The ride was smooth and the only downside was that it was too overcast to see much of the landscape. We landed in Germany with 2 1/2 hours before our connecting flight to Dulles. They sent everybody with connections up this escalator, at the top of which was a security checkpoint. The line was NOT moving and there was only about 10 yards between the top of the escalator and the checkpoint! We were all squished together. When the line finally did move, it was very slow. We had to remove shoes and coats and all items from pockets. They wanded and patted us down. Then they went through all our bags after they came through the scanner. I was trying to put everything back in the wheelie back so it would zip while Matt took care of the laptop, when he said to hurry up. Apparently, some security people had told everyone headed to the states to follow them. We passed a coffee bar, a newstand with snacks, etc., and several seating areas before coming to another security checkpoint. Once again, we had to remove shoes, coats, pocket stuff and get wanded/patted down while our bags were scanned and searched!! We walked down a short hallway, descended a flight of stairs, and were greeted by a giant waiting area. There was a non-functioning soda machine, a snack machine, the ticket counters, and lots of seats. It was very depressing and I was practically in tears after being patted down, having the bags rifled through, and losing the opportunity for a hot lunch (not to mention being 5 months pregnant and exhausted). Matt asked and we were allowed to go back to the small part of the terminal we passed through between checkpoints. I left him with the bags and discovered that, unless I wanted coffee, the newstand was the only option. I got Matt a book to read on the plane, 2 cans of pringles, and 2 candy bars. Not much, but better than nothing. The prices were in euros, but you could pay with dollars…all I can say is that the prices are terrible even without the exchange rate, so the less you have to buy in an airport, the better! After being screened again, I finally made it back to the waiting area and we passed a long hour reading and munching. Some birthday for Matt 🙂 But our flight to the states made up for the earlier hassles. We were on a United 777 and it was great. We had a window and aisle seat, there was lots of room between the rows (so you could really stretch your legs), and there was even a TV in the back of the seat in front of you. The seats were really comfy and the service was great. We got a snack, a really good dinner (chicken in an herb sauce, mixed veggies, mashed potatoes, roll, salad, cheese/crackers, grapes. and ice cream), and another snack (sandwich, chips, and candy bar). Plus, they had 8 or 9 channels all showing something different, so you had a wide selection of movies/shows to choose from. You could watch one and then flip to another channel to see something else. Matt was able to sleep some, but I couldn’t, so the variety of choices really helped to pass the time! The flight was really smooth as we had great weather, and I was even able to see some of the ocean during breaks in the clouds. I got a few shots of the coast of Canada as we reached North America, and we were treated to some great views of the landscape since it didn’t get dark until about a 1/2 hour before we landed. We got to DC around 7:30, went through passport control and customs, picked up our checked bags, went through security again, and rechecked our bags before heading up to our gate for the flight to Richmond. There was a Subway close to our gate, so we hung out and had something to drink while we made a few important phone calls to family and friends. We were on our plane and in the air by shortly after 10 pm and I was so glad to hear that the flight would only be 15-20 minutes. We landed in Richmond by 10:30 and after walking “forever” to get to baggage claim, we were happy to locate both our bags and be outside waiting for our ride before 11. It was so good to be home. Don and Stacey took great care of our fish and plants! I don’t think we actually made in bed until after 1, but we were up early on Thursday. So we treated ourselves to Krispy Kreme!! We’ve spent the last three days unpacking, sorting through mail, and running errands. It’s been busy and I think it’s been harder to adjust our internal clocks back to US time than it was to get used to Serbia, but it’s all good. God so blessed our trip and I am so thankful for the opportunities we had during our time in Serbia!! 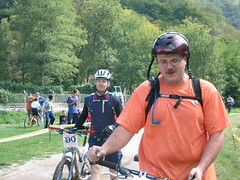 [30 Sept 2006] We have all of our pictures online now. 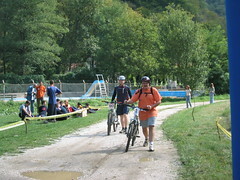 To view them, go to our 2006 Serbia Pics gallery. [29 Sept 2006] We are in the process of scanning some items and getting them ready for posting. We are also getting all of our pictures uploaded. By the end of the week, I would expect everything to be online. 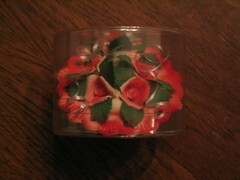 We’ll update this page with pics and more then. But, while you are waiting, sit back and enjoy some Serbian music. While in Cacak, we went to a concert by Goran Bregovic. We didn’t stay for the whole thing, but the people seemed to really like him. We bought one of his CDs. Click the link below to download an mp3 of a song off that cd called Chupchik. I don’t have a clue what the words mean, but the tune was catchy and representative of the music at the concert. Chupchik by Goran Bregovic. 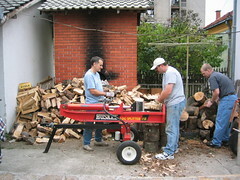 [26 Sept 2006] This is our last update from Serbia 🙁 We leave from Belgrade (2 1/2 hours north-ish of Cacak) around noon. Yesterday afternoon, after computer stuff, we headed for the mountains. We were going to eat at this neat seasonal restaurant that Karl and Julie really like, but it was closed. So we grabbed snacks at a little store and had a wild ride up Kablar. It was a lot like driving through most of WV! Karl even managed to get the van up the dirt path toward the top that usually isn’t passable for vehicles. We hiked up just a little bit after we parked, and were treated to an amazing view of Cacak and the surrounding mountains. Matt took some fantastic pics, and we’ll post those when we get home. We stopped for a late lunch/early dinner at Petrovic (the place by the dam where we ate early on in our visit). Matt and I split becka snicle (weiner snitzel) and we should have taken pictures. The plate had two huge pieces of breaded meat, plus french fries! It was pretty good, but we both preferred the pork thing we had the other time. We definitely enjoyed the bread…we so need to find a Serbian bakery in the states! We had another good evening at English club, this time discussing travel. One of the older guys has been to many countries all over the world…and he’s also managed to visit Missouri and Iowa!! Today was a busy day. I packed up our clean clothes, as Julie was kind enough to share her washer yesterday, and organized our stuff as much as I could. We had amazing homemade (and yet so easy) cinnamon rolls for breakfast. And while Matt was doing more computer stuff, I worked on the chocolate cake to celebrate his birthday. All I can say is that the Betty Crocker cookbook is a necessity for any kitchen! 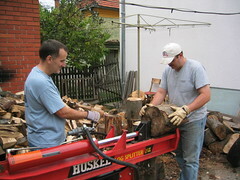 Matt spent the rest of the afternoon until English club working with Chris. I packed away today’s purchases and decorated Matt’s cake with the beautiful cake decorations one of new Serbian friends brought us. She gave us the other decorations (see previous entries for pics) when Karl and Matt cut wood at her neighbor’s house last week and she brought over a whole container of small flowers and large roses, and even letters for HAPPY BIRTHDAY! And the lady they cut wood for sent over a big chocolate bar for Matt!! We were sad to attend our last English club, but we are so excited about our new friends. One of the guys brought Matt a Serbian flag and hat! Very appropriate to our continuing discussion of travel 🙂 Most everyone remembered to bring something from their travels. Matt was a little embarrassed about my penguin, but he’s been a lot of places with me…so I guess Matt will just have to get over it! We managed to spend the rest of the evening working on computer stuff and getting ready for tomorrow. I think I’m ready to be home, but I will miss our friends…American and Serbian!! [25 Sept 2006] Matt didn’t mention it, but the concert on Saturday night was pretty neat. There were tons of people there and even standing WAY back from the stage area, it was REALLY loud! The 1/2 hour of music we listened to was a lot like most of the traditional Serbian music we have heard. There is a distinct middle-eastern flavor, with some of the instrumentation and the “wavery” voices, but also a polka-ish influence to many of the songs we heard. It grows on you 🙂 We’ll have to look for a CD before we come home. Just a quick side note, it was interesting to see cotton candy and popcorn vendors scattered throughout the crowd…many Serbians seem to be very tall (some of the guys in the crowd made Matt look kinda shrimpy)…etiquette is a little different here, you just have to make a spot for yourself when you want to get through…and there’s no such thing as non-smoking (in or out). After a simple lunch, the boys headed off on their ride and Becky and I went for a walk. She took me to a park on the outskirts of town. We walked (leisurely!) up this long hill and at the top were treated to an incredible view of Cacak. It was so worth the climb! It didn’t hurt that we took our time and that Becky didn’t mind taking breaks with me :^) We had a great time of fellowship as we walked back to the city center and had ice cream cones. Mine was some kind of vanilla with raspberry, I think…whatever it was, it was really good! This morning, Karl took us to a pekara to try some pastry stuff. We tried a puff-pastry type thing with eurocream and powdered sugar, a giant croissant with ham inside, and a giant croissant with cheese…all for less than $2.00!! My favorite was the cheese thing…fluffy croissant and just the right amount of cheese. The sweet one was good, but too much puff and not enough cream :). The croissant covered with eurocream that I had on Saturday is my overall favorite for flavor and texture. [25 Sept 2006] Yesterday was Sunday (just like it was everywhere else in the world :^). I’ll let Cyndi talk about the service, but the uniqueness of Christianity still strikes me: we can worship God in any language…we aren’t tied to one language. 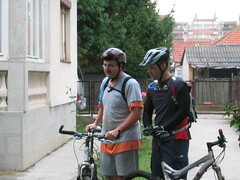 One of our friends had been invited by some guys at the english club to go on a bike ride. He mentioned it to me and invited me. 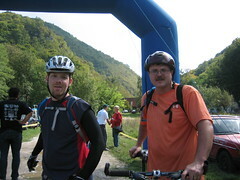 We were going to ride from Cacak to Ovcar Banyo (I hope I spelled it right. It is pronounced Ovchar Banyo. The same place we ended the bike race Saturday). 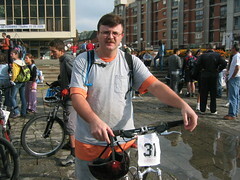 Well, I had a bum bike, but our friends said they had another, but it was bigger. I tried it out, it fit, so I said I would go ride. Total distance covered was about 40km. Before we started, I was worried about the kind of ride. Would it be on the road? Would it be on dirt? How fast were these guys going to ride? It turned out, I didn’t have anything to worry about. We took a nice pace through town, crossed the Moriva River, and started up the road. Our pace was slow (this wasn’t a ride like I was thinking of…more like a touring ride). We chatted as we rode through the country. One of the guys spoke very good english, and the other spoke ok english (we had to wait on translations sometimes). Serbia is a very, very pretty country. I have some pictures that I’m uploading now. When they are up, I’ll post them. For now, imagine the mountains of West Virginia and you’ll get a good approximation. One of the guys riding with us seemed to know everyone! Every little bit, he would point out a house and say that his friend lives there. He would call out to people we saw and they would reply. It was amazing. Something like the sort of thing you would see in a small town in the US. The pace of life is slower here too. We were riding on a road (sort of like a paved country road in the US…only a tad narrower) but cars would pass us on the other side. They weren’t flying like they were in a big hurry and seemed to be doing about 40 mph (yes, the road could have supported more). Half-way to Ovcar Banyo we stopped at a cafe for some drinks. While we were there, I needed to use the WC (that’s what they call the bathroom here) so I went back. One of the guys was already there, and when I tried going in, he made a comment about the women’s restroom. I thought I was going to the right one, so I kept going. He said it again. Finally, I got the idea…he was trying to tell me that there was a woman in the men’s room. Now I understood! I went back to the table and waited where I found everyone else talking about my experience. Ha ha…the American didn’t understand! Anyway….back to the cafe. It was along a river (I forget the name) and was so pretty. After we drank our drinks (I had orange Fanta) we started going again. 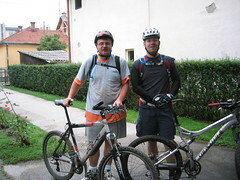 We rode about 5-7 km more and stopped at a monastery. We thought our friends made noises about going to one or the other (there were two very close together) so we picked one to go to. This place was hard to get to. We walked up this concrete road that was about 70 deg up! We had brought pants (you have to wear pants in these places) so we put them on and went in. It turns out this was a nunnery (only women were at this monastery). One of the nuns came out to greet us and showed us around. The guys translated for us. It turns out this monastery was built in the 14th century. The guys were telling us that the monasteries started back when the turks invaded the country and the people went into the mountains to hide. We went into the “church” at the monastery…it was interesting. I wanted to ask about what happened there, but didn’t think it would go through the translation. After that, one of the nuns brought us out some cakes to eat. We ate the cakes, said thanks, and left. We visited 4 other monasteries on our way to Ovcar Banyo. We went through a tunnel (it was about 1/2 mile or so). It was neat….I’d never ridden a bike through a tunnel before. On the other side, we wound around the mountainside and enjoyed the countryside. In Ovcar Banyo, we stopped and had drinks and some snacks (you’ll get fat riding a bike). Our friends asked us if we wanted to try this one drink. After being told it was non-alcoholic, we had it. I don’t remember what it was, but I’ll try and find the link to post later. We went up to another monastery where we got yelled at a bit (we didn’t know we were going up and had taken off our pants so we couldn’t go into the church). They had two springs….1 hot and 1 cold. It was neat. We then started riding back on the main road. 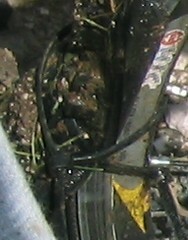 This was the part that had worried the guy I was with (he is a mountain biker not a roadie). It turned out it was no problem. Right as it started getting dark, our friends yelled to us that it was time to stop (again). Turns out they wanted to take us to this floating restaraunt for fish. It was almost dark, we tried to say no, but there was no way we could. (I forgot to mention that our friends paid for the drinks at the cafe and paid for the drinks and snacks in Ovcar Banyo). The guy I was with tried to make noises about him paying, and everyone finally relented. We would eat and the guy I was with would pay. We sat and talked and talked. Our friends had ordered for us, and the waiter brought out this fish soup (it had an alcohol burner under it and everything). This stuff was great!! After we ate it (it was already dark by now), they asked if we wanted anything else. We said no, but we sat and talked some more. Later on, the person that turned out to be the chef came out and asked if we wanted anything else. We ended up and ordered this stuff called palichenka with ice cream. They are little pancake/crepe things stuffed with apples, kiwi, bannana, and sugar covered with whipped cream and ice cream. They were so good! By now, it was pitch black (8:30 pm or so). When we started back, one of the guys had brought lights for everyone. 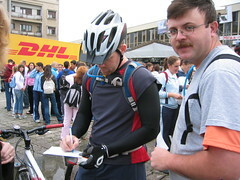 He taped them onto our handlebars and we started back (10-12 km more). What an experience! Imagine riding on a main road, at night, and with lots of traffic. It was…..interesting. I need to get ready for the day here, but I’ll write more later when I post the pictures. 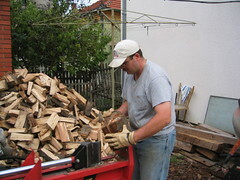 [23 sept 2006] Matt posted several pics I’ve taken in the last couple of days, including some of the log-splitting. 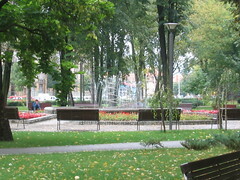 While they worked, I went on to the city center and enjoyed walking around. I was able to navigate the many blocks there and back with no problems and I even bought a few things while I was there. I toured the 4-level mall and bought a cyrillic writing workbook and a puzzle of Serbia (which shows the country complete with many cities, even Cacak, and the surrounding countries). Then, I wandered to a bookstore and bought a book, in English, that seems to have been written and illustrated in Serbia…I also saw it in cyrillic, but that copy of the book was in really bad shape. It was pretty cool to be able to complete transactions all by myself, even if they were pretty simple and mostly involved little talking. I headed back to meet the guys and they were just about finished. The lady they were helping brought out Turkish coffee and cola. I tried a couple of tiny sips. It is WAY strong, and I don’t really like coffee to begin with! Poor Matt drank both of ours!! English club enjoyed another successful evening, and there were even a few more people there than on previous nights. We talked about travel and museums and it sounds like there are some really neat places to visit in Serbia and the surrounding countries! This morning was devoted to race stuff, which Matt has already shared from his perspective. I can only add that us girls, after taking some pics of the race start, went to a peccora (bakery-type place) and found some yummy stuff. I had this giant croissant covered in eurocream (chocolate-y stuff) and it was only 35 dinars (aka 60 cents)!! They also have dfferent pastries stuffed with meats, but we decided it was a little too early. Once we saw the boys off, Julie headed back to the house and Becky and I ran some errands. We bought local honey at the walking street where the race started (there were vendors from all over selling honey and related products). We also went to Mercator, which is a small mall across town, to look around and get groceries. I found some books written in cyrillic and also got some Serbian pastries for Matt and I to try. We’ve had plenty of meats and we felt that it was only fair to sample some of the sweets :^) We had a little nibble later on, and so far, so good! The boys were understandably tired and filthy, and I’m sure disappointed in the turn of events, but they were troopers! The views were gorgeous and I took several pics while we waited for them at the finish. Matt kept talking about the views from the mountain on the course. 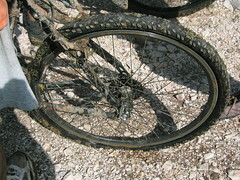 I wish I could have seen it, but Lydia and I weren’t up to that kind of challenge 🙂 They spent a really long time cleaning up the bikes before we finally sat down to a lunch of hamburgers (Cacak-style) and pom frits. [23 Sept 2006] Before I talk about today, I wanted to post some links to some pictures of some of the places she visited (once we are all done, they’ll be in the gallery with all our other pictures, but for now we are posting them one at a time). 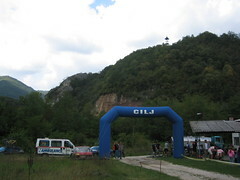 When we arrived in Cacak (pronounced Chachak BTW), I learned of this mountain bike race. I’d never ridden off road before, but Chris really wanted to do it (he is trying to find a way to meet people who are into sports here). 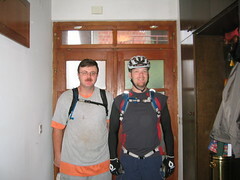 Chris and I went out and rode Monday or Tuesday….it wasn’t too bad. 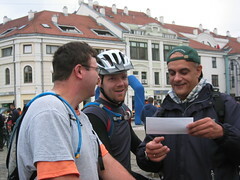 Then, we found out that the race only cost 400 Dinars to enter (that’s like $7.00 or so in real money). AND you got a free t-shirt! Well, I couldn’t pass up the shirt, and I wanted to help Chris out. I said I would do it. (I’ll get a scan of the brochure up on the web as soon as I can). Last night it rained. Hard. This morning, it was cold (the internet said 7–that is about 50-55 in real temperature). 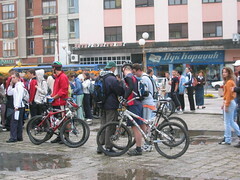 We got ready and rode down to the city center to register. We arrived and didn’t know what was going on. We couldn’t ask anyone (neither of us speaks much Serbian) and didn’t see anyone official. We had one guy ask us. We appologized that we didn’t speak much Serbian. The race started with a prologue of 2 km (a prologue is where everyone just rides to warm up) then the race really started. I wish I had pictures of the race course. Serbia is a pretty country. Almost as pretty as the farm, but not quite. Everything reminded me of West Virginia. But…more about the race. I didn’t have a computer on my bike so, the distances are guesses. 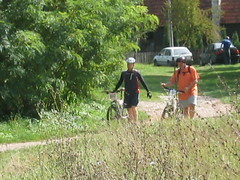 We rode a total of 5 km (including the prologue) on pavement. It wasn’t too bad. It was a slight uphill, but nothing bad. Then, the hill got steeper. It got muddy. Most of the time, I was walking and pushing my bike up hill. It was so muddy and slick and steep that I don’t think you could have gotten a 4-wheeler up this hill. And these people were on bikes (well, most were pushing too). Once we got to the top, we raced along a ridge line for a while. It was so pretty! I descended down this hill…these people are crazy. I rode faster down this hill than I would have driven a 4-wheeler! I made it down alive (only fell 4-5 times…none serious). We rode along then at about the 10-12 km mark (on pavement) I heard what I thought was a gunshot. I wondered who was shooting and where they were. Well, when I looked down, I realized that my tube had popped! ARG! We stopped and started repairs, but soon found out that the tire had actually bust open right about where the tire meets the wheel. There wasn’t a really way to repair it, so we tried to ziptie the hole. It looked bad but we said we’d give it a shot. Well, I got about 20-25 yards when I heard the pop again. It looked like I was walking! Chris was a good guy and stuck with me even though I told him to go ahead…I could walk it myself. We ended up and walked 8-10 km! Here are pictures of us finally coming into the finish (we were walking because we had more bike trouble later on….I tried riding when I could….eventually the tube came out, wrapped itself around the rear derailer, broke it of, on and on and on). Anyway, I lived through the race. I had lots of fun. I think Chris got some good contacts with some local people. I might even try some off-road riding at home. I feel bad for Chris….he could have done way way better than I did. [22 Sept 2006] Yesterday was a great day of fellowship with Chris and Becky. We walked the few blocks to their house and had breakfast (pancakes, omelet, strawberry yogurt with bananas…poor Matt won’t want to go back to oats and raisins!). We then headed to the police station where they picked up their visas, which are good for 1 year! Chris and Matt headed back to do computer stuff while Becky and I walked around the city and enjoyed the beautiful day. 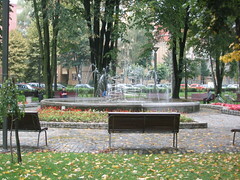 She took me to a local park (Gradsky, I think) and I have lots pf pics of the fountain. 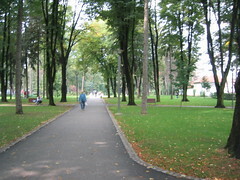 We followed to walking trail down to the river before heading back to the city center. It was great fun to chat and walk as we explored bookstores, a baby store, and generally window-shopped. We also went into this market where I found Kinder eggs (made in Germany- a thin chocolate shell surrounds this capsule with a toy, some assembly required, inside…not available in the use as the FDA views it as a choking hazard and won’t clear it for import…we’ll have to take a picture so you can see how silly that is, cause the thing is way bigger than most prizes in cracker jacks, etc. and that capsule is WAY hard to open). On the way back to the house, she showed me the piazza, which is this large, open-air market full of fresh fruits, veggies, and flowers, plus other odds and ends. I think we’ll have to go back one morning and explore. We finally got the boys away from the computer and headed to Remini’s, which is an awesome pizza place! The crust is thin, but still substantive, and the sauce is light, but tasty. I had ham, which came in thin slivers and didn’t taste anything like ham you would get on pizza in the states. Matt had “la maffia,” which had eggs, bacon, onions, and peppers…so it was almost like a breakfast pizza. We split some excellent pom frits and we are definitely going back there before we leave!! We wandered back to the city center and I was able to order an ice cream cone all by myself! Dobro jagoda (good strawberry)!! I am just so thankful for the gift of friendship. It will be nice to be home and to start getting ready for Lydia’s arrival, but it will be very hard to say goodbye to our wonderful friends in Cacak!! [20 Sept 2006] Tuesday was another day devoted mostly to website stuff. After helping with some housekeeping (I ran the vacuum in Serbia…and Matt took the pictures to prove it! ), I read a little and took care of some email. 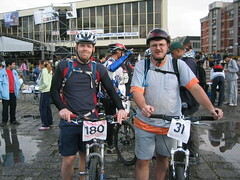 After club, Matt and Chris were talking about a mountain bike race just outside of town on Saturday. One of the guys helped them decipher the brochure and they decided to enter (the fee is 400 dinars…about $7). For that, they get to ride, are covered by race insurance, AND get a t-shirt!! They went for a practice ride this morning, and after being gone for 3 1/2 hours (20 miles), they returned tired and filthy, but triumphant :^) After that, Karl and Matt took off to do some log-splitting for a neighbor while I read and rested. It started raining again during the late afternoon, but the guys just kept going. I decided to go for a wolk during a brief lull and met them coming down the street (they just pulled the splitter manually since it was so close). Matt got to enjoy Turkish coffee at the lady’s house and I think he liked it. We’ve been hearing about it since we got here. Apparently, it’s something that is frequently offered to guests and is VERY strong, besides being unfiltered…so don’t drink the last little bit! I really need to take a picture of Lydia’s Serbian clothes (the penguin tights and the overalls, so far) so everyone can see how cute and girly they are…and with no hint of pink!!! We headed to Mercator before dinner to pick up some things. It’s a mall with a grocery store. There are escalators, without steps…so it’s like those moving paths in the airport positioned at an incline. The grocery store was on the 2nd floor and if we hadn’t decided it would be too tourist-y, we would have taken a picture of us taking the cart back down to the main level! Anyway, the store was really nice. Spacious, well-lit, and so clean. Matt decided to try some sausage stuff and the girl at the counter was very helpful. With Karls’s help, Matt told her he only wanted half a stick (or x number of grams) of 2 different kinds, and it was just like the deli counter back in the states. I continue to enjoy how friendly and helpful (and patient) people here generally are. Chris and Becky were waiting at the house when we got back. We all tried the sausage and decided that it was rather tasty, but Julie’s BBQ was the star of the night! Serbian food is great, but there’s nothing like good old-fashioned Southern cookin’. Tomorrow should be a fun day. We’re having breakfast at Chris and Becky’s, then Matt and Chris will do computer stuff while Becky and I go exploring. 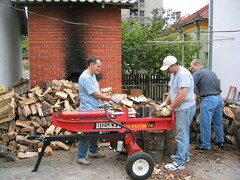 And we’re planning to have lunch at a Serbian pizza place in the afternoon. I can’t wait!! [18 Sept 2006] Matt did a good job sharing about yesterday, which was a really good day. After church, we walked to a nearby restaurant for lunch. We had karadorceva (I don’t think I spelled it right, but it’s pronounced karah-george-cheva), which is veal, rolled with cheese and ham, breaded, and deep fried! I’m sure it’s so bad for you, but we split the thing and it was awesome…and it was only about $6!! Plus, we had pom frit french fries) and shopska (the tomato, cucumber, and feta cheese salad Matt has fallen in love with). The rest of the day was time to relax and rest…except for Matt and Karl, who spent all day working on the web stuff and didn’t call it a day until 3 AM!! Today, they worked more on the computer, but we found time to go to the post office (where we mailed a few post cards…which cost almost 400 dinars, or around $6! ), and the exchange office to get more dinars. While out, we stopped at the giros place and I went to a “newstand” (they’re everywhere…selling papers, magazines, candy, drinks, etc.) and bought water for lunch all by myself 🙂 Matt now knows the Serbian words for onion (tsurniluke) and tomato (paradise). Did I mention that all my attempts at Serbian spellings are more for pronunciation than accuracy?? We got to spend time with other American friends this afternoon. We also enjoyed a great dinner…fried chicken, mashed potatoes, broccoli, and shopska, before heading to another evening of English club. There were four Serbian guys there, and we had a good time discussing music and eating the chocolates Matt and I brought from home. And now it’s time for bed! Since it rained this evening, we’re really feeling the lack of sleep last night and nap today :^) Have a good one back home!! [18 Sept 2006] Sorry for the lack of updates to the page. Our friends and I spent all day Saturday working on the website and Cyndi didn’t get to use the computer. We then spent most of Saturday afternoon working on it, too. We were up last night till 3am working on it!). Sunday was neat. We had “house” church ourselves with some nationals. We sang songs in Serbian (I tried to keep up…I just don’t process new things quite fast enough to really keep up), watched the Jesus film, and talked about it. It was my first experience at something like that…it was awesome. What struck me as we were singing was how awesome God is. Some other religions–this Islam–restrict their god to one language, but the One True God (who created all language BTW) wants all peoples of the world to worship Him. Those other gods either don’t show themselves to the people or other peoples who convert to that religion are in a funny second-class status because they can’t read their holy writings. Contrast that with the One True God…He wants everyone to know Him and enter into a relationship with Him regardless of language. I’m sure Cyndi will have more to write today about somethings. Till then…Ciao (that is Serbian for goodbye). The scenery was better, but I didn’t want to seem like too much of a tourist snapping pictures everywere. 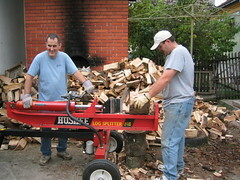 Our big adventure was log splitting…well, Matt and Karl worked while Julie and I visited. We drove to the home of a widow who cares for her elderly mother. 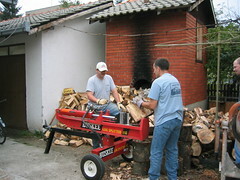 Most of the people heat their homes with wood in the winter and she had been splitting the wood by hand until she heard about our friends’ log splitter and came to the house yesterday morning to arrange for their help. Serb people pride themselves on their hospitality and she offered us sodas and cookies while we sat and talked. A neighbor was with her and they were very welcoming…telling me how young and sweet I was. They were also excited about the bebe (baby). 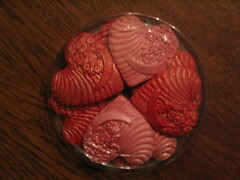 Another neighbor came over later and brought gifts. 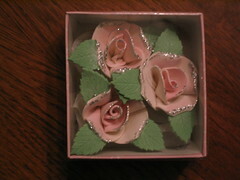 She makes cake decorations (perhaps out of fondant??) and Matt took some pictures so you can all appreciate her artistry. I wish I could have understood more of the conversation, but it was just really neat to spend time with the local people. 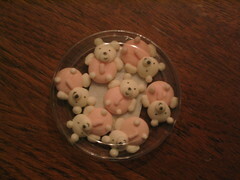 The lady made sugar cake decorations….some pictures are below. We also had English club last night. We walked the few blocks to the building where they meet and there were five Serbian guys, plus Julie, Becky, Matt and I. We talked about entertainment and had a lively discussion about what Serbs enjoy vs. Americans. We meet again Monday, so I’ll share more about the club after that. This morning, Matt woke up early and worked on the website while I enjoyed sleeping in :). After a breakfast of Special K and mleko (milk), I got ready to attend language class with Becky. She has a private tutor and they meet at the English club a few times a week for Becky to practice speaking, reading, and writing (latin and cyrillic!). She has workbooks to go through (both for homework and class) and I am very impressed with her progress. I’m so glad she let me tag along! After that, us adults drove to a local restaurant that overlooks a dam along the river. It was a beautiful day in Cacak and the place was very nice. Matt and I were going to split a veal dish, but the power was out! and they couldn’t prepare it. So we had this rolled pork, stuffed with cheese and wrapped with bacon. 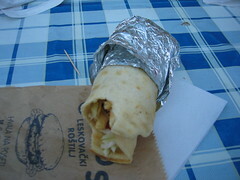 It also came with potatoes and carrots and we had a salad (shopska-which is tomoatoes and cucumbers with feta cheese). The food was really good and I love the local bread! I think we’re going to eat dinner and watch Cars tonight and we have church (here at the house) tomorrow morning at ten. 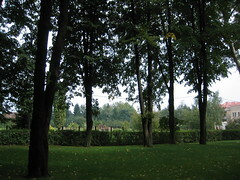 [15 Sept 2006] We had a nice, relaxing day yesterday. Matt worked on computer stuff most of the day. I got to go to the store with our friends. It was pretty interesting to see so many American items, like candy and cosmetics. Oh, and I picked up a packet of Serbian ketchup…but it’s just plain, not spicy or the pizza kind. I also added to my growing list of Serbian words…which I won’t share here since my spelling would be completely wrong! On the way to the store, we had to stop and be registered with the local police. While in the area, we stopped in to see the local Orthodox church and walked around the city center fora bit. There are cars, people, and businesses everywhere! And the ice cream…yum… I had a mali con (small cone) with two scoops, as did Matt. Mine were just chocolate and something similar to chocolate chip, while Matt had chocolate and some kind of fruit cookie stuff…which sounds weird but was really good. I can’ wait to see how today turns out…and we have English club tonight!! The flights weren’t too bad, just long…especially the 8 1/2 hours from Chicago to Munich. The flight from Munich to Belgrade was gorgeous! It was a clear day, so we could see the ground the entire time (which is not something I have gotten to enjoy in my 3 previous flights. The Austrian Alps were just beautiful! We ate at McD’s on the way to Cacak and by that time were able to “mostly” complete simple transactions on our own. (By the way, Matt got a “McZorba” which is a burger with feta cheese, cucumbers?, and something else. We didn’t really know what it was exactly, but he liked it!) Our basic Serbian, though obviously limited to simple words and phrases, is already growing. We’ve enjoyed bonding with our friends and we’re looking forward to the days ahead! Thank you for praying for us! God has been so good to us (as always!) and we are thankful for this opportunity to see Him at work across the world!! The Kingdom of Serbs, Croats, and Slovenes was formed in 1918; its name was changed to Yugoslavia in 1929. Occupation by Nazi Germany in 1941 was resisted by various paramilitary bands that fought each other as well as the invaders. The group headed by Josip TITO took full control of Yugoslavia upon German expulsion in 1945. Although Communist, his new government and its successors (he died in 1980) managed to steer their own path between the Warsaw Pact nations and the West for the next four and a half decades. In the early 1990s, post-TITO Yugoslavia began to unravel along ethnic lines: Slovenia, Croatia, Macedonia, and Bosnia and Herzegovina were recognized as independent states in 1992. 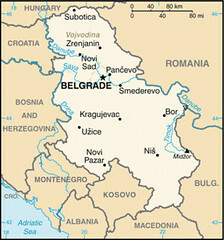 The remaining republics of Serbia and Montenegro declared a new Federal Republic of Yugoslavia (FRY) in April 1992 and, under President Slobodan MILOSEVIC, Serbia led various military intervention efforts to unite ethnic Serbs in neighboring republics into a “Greater Serbia.” These actions led to Yugoslavia being ousted from the UN in 1992, but Serbia continued its campaign until signing the Dayton Peace Accords in 1995. 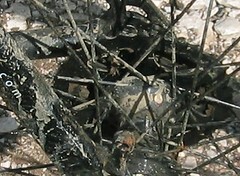 In 1998-99, massive expulsions by FRY forces and Serb paramilitaries of ethnic Albanians living in Kosovo provoked an international response, including the NATO bombing of Belgrade and the stationing of a NATO-led force (KFOR), in Kosovo. 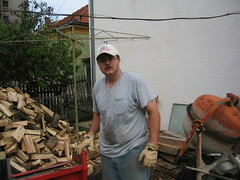 Federal elections in the fall of 2000, brought about the ouster of MILOSEVIC and installed Vojislav KOSTUNICA as president. 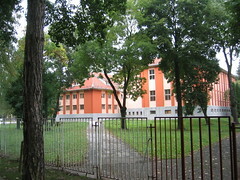 The arrest of MILOSEVIC in 2001 allowed for his subsequent transfer to the International Criminal Tribunal for the Former Yugoslavia in The Hague to be tried for crimes against humanity. In 2001, the country’s suspension from the UN was lifted, and it was once more accepted into UN organizations under the name of the Federal Republic of Yugoslavia. Kosovo has been governed by the UN Interim Administration Mission in Kosovo (UNMIK) since June 1999, under the authority of UN Security Council Resolution 1244, pending a determination by the international community of its future status. 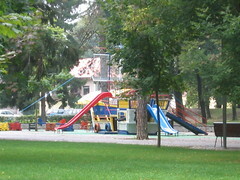 In 2002, the Serbian and Montenegrin components of Yugoslavia began negotiations to forge a looser relationship. In February 2003 lawmakers restructured the country into a loose federation of two republics called Serbia and Montenegro. 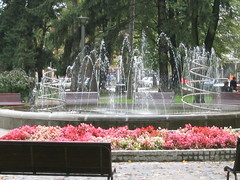 The Constitutional Charter of Serbia and Montenegro included a provision that allowed either republic to hold a referendum after three years that would allow for their independence from the state union. 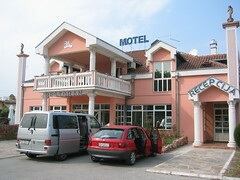 In the spring of 2006, Montenegro took advantage of the provision to undertake a successful independence vote enabling it to secede on 3 June. Two days later, Serbia declared that it was the successor state to the union of Serbia and Montenegro. [Update 2012-12-26 09:08:32] When I migrated maxsons.org from phpnuke, this page got broke. I never updated it so the pictures worked. The pictures are back up using flickr. I haven’t rewritten the page although, I plan to using individual articles and a category.